Located between Usakos and Swakopmund in the Namib Desert, the natural beauty of the Spitzkoppe, or Spitzkop, is spectacular: an island of bald granite peaks situated in an endless grassy plain that is visible for miles around. Groot Spitzkop is often referred to as the 'Matterhorn of Africa' because of its similarity in shape, and it is one of Namibia's most famous mountains. 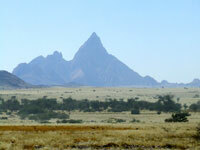 Nearby are the Little Spitzkoppe and the Pontok Mountains. The enormous granite rocks formed hundreds of millions of years ago due to volcanic activity. Subsequent erosion has resulted in fascinating rock formations and memorable outlines that should not go unexplored. The area is a paradise for climbers, although only those with a lot of experience and the correct equipment should attempt to climb the Spitzkoppe. Many San rock paintings exist in the Spitzkoppe area and these ancient artworks are thrilling to seek out. At the foot of Groot Spitzkop, Rhino Rock boasts some of the best surviving examples of prehistoric rock paintings. Sadly, many have been destroyed. The area is also renowned for its breath-taking sunrises, which turn the rocks from pale orange to flaming gold.